Shortly after I started food blogging I came across he concept of macarons. Macarons are a French pastry made with almond powder, icing sugar, egg whites, and sugar. (The short list of ingredients makes the macarons sound deceptively easy to make.) The macarons form a sandwich with a layer in between. I had some green tea buttercream and white chocolate ganache left over from making my green tea and white chocolate opera cake and I thought that they would make nice fillings for macarons. I decided to continue with the flavour theme and went with green tea flavoured macarons. I have to admit that the first batch of macrons did not turn out too good. They stuck to the parchment paper and they were all destroyed as I tried to get them off. I thought that greasing the parchment paper with butter might help so I tried a second time. I was a bit upset when the second batch also stuck to the parchment paper but I decided to leave them for a while after destroying only two of them. After a few hours I tried again and they came off easily. Maybe a silicone sheet would be handy for things like this? All of the effort was worth it as the macarons tasted great! They were nice and light and airy. I really enjoyed the matcha flavour of the macarons and it went well with the green tea buttercream and white chocolate ganache fillings. I look forward to making macarons again and trying different flavours. Sift the icing sugar, ground almonds and matcha together into a bowl. Beat the egg whites until just stiff. Beat in the sugar until just stiff. Fold the almond mixture into the egg white mixture. Pour the batter into small discs on parchment paper on a baking sheet. Let sit for an hour so that a thin layer forms on the outside. Bake in a preheated 325F/170C oven for 10-11 minutes. Let cool and then fill with filling. Kevin, I’m speechless (well, almost, haha) – those macaroons are GORGEOUS!! I’m so intrigued by the use of green tea. I live in Toronto too, where do you buy your matcha powder? Beautiful macarons. I think if you would have let the first batch sit for a while, they would have come off easily. They are very similar to a meringue and they gotta firm up first. These are an awesome color, they look too neat to eat! Great color combination and I love the result. I never attempted macarons before. You did really well. Looks great! You have way more courage than me. Im totally afraid to make macarons. Bet they are delicious! These really do look great, light and airy! Sorry to hear about the bad first batch, but this one looks great! They’re to pretty to eat, I just want to look at it! How eerie! Since I have a bunch of almond meal left over from the Opera cake, I’m making macarons! I’m going with a raspberry and strawberry flavor. I am so loving your use of green tea flavors! Congratulations on your wonderful-looking batch of macarons! So you’ve caught the macaron bug? They’re such a pain to get right initially, but once you do, the possibilities are endless! They’re so addictive! Ooooh, they came out great! Yet something else I’d love to try–you’re so brave! oh lovely. u tempt me again with your green tea creation. i adore macarons although i’ve never made them in my life. i did put in a lot of effort to trudge through the cold streets during winter in Paris to get a box of them from the pattiserie down the road where I lived. macarons seem so hard to make. yours look so good!! i love matcha! OMG! Is there anything that you can’t do? I’m gobsmacked! Those macarons look great! Well done! You are tenacious indeed, Kevin, I think I may have given up after round two! I am glad you stuck it out, they look fabulous! These look so pretty! Both these and your cake are really impressive–great job! wow, great job! macarons scare me and i will probably never make them unless they become a DB challenge! Beautiful! I keep meaning to try these! A great picture as always Kevin! They look like really yummy macaroons! Steph: I found the matcha at Whole Foods. [Snap! :)] Those macaroons ROCK Kevin! They look so awesome that I am completely jealous of your baking skills. Looks great, I love macaroons. Do you think something like this would work for the matcha part of the recipe – baking matcha? They look AMAZING! I heard that macarons are one of the most difficult things to bake, and yours just look so good! Too good and awesome. I am just loving the color. Just GORGEOUS macarons Kevin and what brilliant photo it captures your bake perfectly!! Oh my God – I was out of island and left you just for 5 days — and you made so wonderful things! I love your “green” baking – both recipes (also Opera) look sooooooo taaaaastyyyyyy! 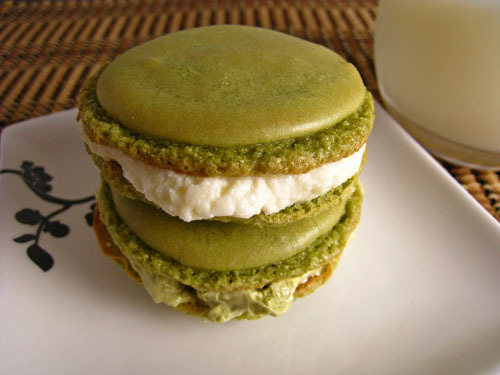 Green tea white chocolate macarons… yum! I admire your fearlessness in taking on new recipes (both baking & cooking)! I’ve wanted to make macarons for quite a while now but I’m scared as I’ve read about the disastrous things that can happen. Yours turned out great though! you MADE THEM!! LUCKY!! And the only issue you had was that they stuck to the parchment paper?? You didnt have any other troubles with the shape, texture, or “feet” forming, etc?? Wow, lucky you! I have tried making macarons maybe 6 times and each time was a FAIL! Ever since I have put the whole macaron-tentative thing on hold. Yours look really great, nice work!! Beautiful! I keep seeing macaron recipes and pictures everywhere, but I don’t think I’ve ever eaten one. I’d be happy to try yours. What a fortuitous encounter. I put a bowl of egg whites out on my counter this morning to await their matcha chocolate ganache macaron fate. I’ve read many recipes calling for silpat mats, but thought it unnecessary. Good to know it’s essential. I love your blog, by the way. Just curious: just how closet-sized is your kitchen? Hi Kevin- I made green tea flavored opera cake for the DB challenge too! I really like green tea pastries because of the subtle and not too sweet flavor. i am dying to get matcha. it’s not easy living in a countryside, i admit. looking at every recipe calls for matcha i would skip unfortunately and be green with envy: why can’t i get matcha as easy as i get potatoes? hehehe… grumpy old woman i am. your macarons look alright, kevin. i’ve also made the recent version of flavour helen made, snicker macarons, that is. and they taste great with black coffee! HI- sorry I’m late with this comment, but maybe you’ll find it helpful all the same. I’m sure there’s no need for a silicone tray- they didn’t have them in the 18th century so I’m sure we don’t need them now. But how to solve the sticking problem? As Raquel says, you did it right the second time, by leaving them to sit for a while. In Ladurée in Paris, they are put aside for 2 days before they go on sale; the flavours are richer that way and as you found, they come easily away from your parchment paper. I'm really intrigued by the use of green tea. I should give it a try next time. I love macarons, and yours look delicious. curiouscat: You should be able to find the matcha in a local tea shop or Asian grocery store. I have seen it in some higher end grocery stores like Whole Foods but it tends to be fairly pricey there. My god, you should be imprisoned! I happened upon your blog and now I'm salivating. I made these tonight. Amazing. However neither my macarons or buttercream was as green as yours in the picture. Perhaps it has to do with the type of Green tea I used. Also my macarons were more round making it difficult to make a neat sandwich, but I may have used too much batter for each cookie. Either way they were a hit thanks for sharing this recipe. Sounds delicious, I've never had green tea macarons! The traditional last step for baking macarons is… immediately after you remove the pan from the oven, set the pan on a solid surface, lift the short end of the pan to about 45 degrees, lift the edge of the parchment, and pour about 1/4 c water on the pan. The water will run down, under the parchment, to the other end and steam the bottom of the macarons. I never asked the purpose, I just did as I was told. After reading your blog and remembering that I've never had an issue with them sticking, I assume that's the reason. I hope that helps! Stephanie: What a neat trick! I will definitely try that!